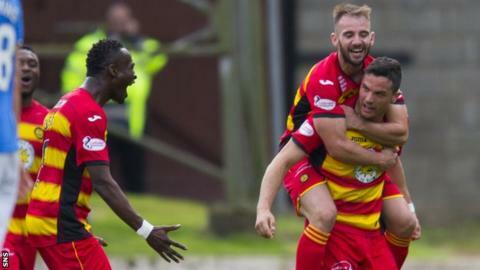 Stunning first-half strikes from distance by Gary Miller and Steven Lawless made it two wins on the bounce for Partick Thistle. Thistle failed to register a victory in their first 10 matches this season but certainly did not look short of confidence against St Johnstone. Steven MacLean pulled one back from close range after the break. But the Jags held on despite seeing out the dying stages with 10 men after captain Abul Osman was sent off. Thistle looked like they could not buy a goal for most of this season and now it looks like they cannot stop scoring them. A 3-0 win over Dundee United last time out actually doubled their tally for the season and brought a first win in 11 attempts. The confidence gained from that result and performance was evident as the Jags played some attractive football and looked the more dangerous side for long spells. That in itself was quite an achievement against a St Johnstone side in a rich vein of form coming into the match with the boost of manager Tommy Wright committing his long-term future to the club. They initially looked a pale shadow of the side that took Aberdeen apart last time out, but the credit for that has to go to Alan Archibald's players in general and Miller in particular. The full-back was handed a chance to face his former club because Mustapha Dumbuya was laid low by illness and he certainly made the most of the opportunity. His use of the ball was excellent going forward and never better than when he blasted his team into the lead in 28 minutes with a belter of a volley from 25 yards. Saints probably feared as much when they saw his name on the team sheet, but it was still a stunning strike from someone who only scored once in three years at Perth. Not that we had to wait for another marvellous goal as the lively Lawless lashed in a second from distance only six minutes later as reward for a fine first-half performance. In response, the home side passed up a couple of half chances, while goalkeeper Tomas Cerny had to move sharply to push away a Dave MacKay curling free kick. That apart, Thistle defended diligently. Until 49 minutes that is, when they allowed MacLean the freedom of the six-yard box to head in a Graham Cummins cross from the left for his ninth goal of the season. Michael O'Halloran's introduction at the interval had certainly helped increase the home side's intensity and only a great Tomas Cerny save denied Liam Craig an equaliser. Cummins then had a chance with a back-post header with nine minutes to go, but Cerny scurried across his goal to claw the ball away. Miller then made a crucial tackle to deny MacLean a second goal after the striker had already rounded Cerny. Osman was sent off for a second yellow card, having been cautioned for a foul in 66 minutes then walking after being booked for deliberate hand ball at the edge of the penalty area. He now misses next week's visit from Hamilton Academical, when Archibald's side will look to continue their revival with a third straight league win. Match ends, St. Johnstone 1, Partick Thistle 2. Second Half ends, St. Johnstone 1, Partick Thistle 2. Foul by John Sutton (St. Johnstone). Attempt missed. Joe Shaughnessy (St. Johnstone) right footed shot from outside the box misses to the left. Tomás Cerny (Partick Thistle) wins a free kick in the attacking half. Hand ball by Gary Miller (Partick Thistle). Substitution, Partick Thistle. Frederic Frans replaces David Amoo. Attempt missed. Steven MacLean (St. Johnstone) right footed shot from outside the box is too high from a direct free kick. Second yellow card to Abdul Osman (Partick Thistle) for hand ball. Hand ball by Abdul Osman (Partick Thistle). Attempt saved. Graham Cummins (St. Johnstone) header from the right side of the six yard box is saved in the top right corner. Corner, St. Johnstone. Conceded by Gary Miller. Attempt blocked. Liam Craig (St. Johnstone) right footed shot from outside the box is blocked. Substitution, St. Johnstone. Liam Caddis replaces David Wotherspoon. Attempt blocked. David Mackay (St. Johnstone) right footed shot from outside the box is blocked.